You never want your battery to die while you’re out on the water. A good boat battery charger can go a long way to making sure you’re never stranded. The question you’re probably asking is how to find the charger that will work right with your battery—and how to get it at the best value. If these are your questions, you’ve come to the right place! Read on to learn about the ten best boat battery chargers on the market and see advice on how to pick one. Anyone looking for portable power will find what they’re looking for below. This compact charger is perfect for small recreational boats. It’s completely safe and very durable for both permanent maintenance and quick charges. We’ll start off with this remarkably portable battery charger from BMK. It’s the perfect charger for batteries of small recreational boats. It has the power to keep you on the water longer for a reasonable price, in a very compact package. The casing of this BMK charger is completely waterproof. It’s made of a high-quality plastic that resists damage from impacts or vibrations without carrying a charge. Along with interior protection against sparks and surges, that makes it a very safe choice. It’s a good ideal not only for boats but also for cars, motorcycles and so on. It’s easy to hook up this charger to any battery. It includes both alligator clamps for quick charges and rings for permanent installation. This convenience and usability are what caught our attention and earned its spot on this list. This dual-bank charger is both safe and efficient. It works two times faster than other chargers along with restoring damaged and dead batteries. If you want to charge your batteries in a hurry, the Genius line from Noco is your answer. 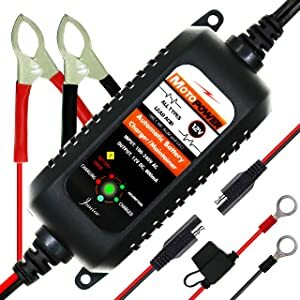 This onboard boat battery charger has an all-plastic casing that’s safe and easy to install on any boat. Best of all, the dual charging banks let you use it for both your starting and trolling battery. Noco’s Rapid Charge technology is impressively fast—twice as fast as most chargers. That’s not the only smart thing about this charger, either. Its advanced reconditioning system repairs dead and damaged batteries. Chargers from Noco don’t come cheap. If you want the fastest charge possible, though, it’s worth the price. The advanced repair function can be a life-saver, too. This 2-bank charger can work on both 12-volt and 24-volt batteries. With two charging banks, it’s one of the most efficient and versatile marine chargers. For over three decades, Professional Mariner has devoted themselves to producing high-quality marine equipment. Their on-board fully-automatic marine battery charger is the top of the line for speed and efficiency. The dual charging banks are helpful, too, especially for seasonal storage. 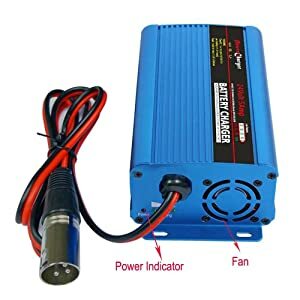 This charger will work with both 12v and 24v batteries. It’s very efficient, too, and offers automatic reconditioning features that can improve your battery’s lifespan. The price of this charger is reasonable considering what you get. Having said that, it is on the pricey side, especially for a hobbyist. For serious boaters, though, the extra expense is worth it for the dual charging banks alone. A lightweight and compact charger with the power for all battery sizes. This is a great option for both on-board maintenance and long-term storage. 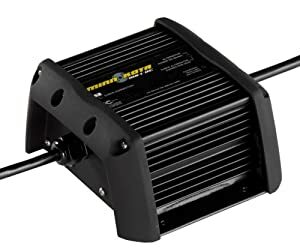 Here’s another great choice from ProMariner that gives you a lot of versatility and power in a portable package. In our opinion, this is the best boat battery charger for long-term on-board maintenance. While it’s not the cheapest option out there, the performance is worth the price. You can use this charger for stored batteries, too. In that regard, the Recondition Mode is probably the most impressive thing about this charger. It gives stored batteries a monthly reconditioning so you can count on them when you need them. Versatility and reliability are the strong points here. It’ll work just as well for you on the boat as for off-season storage, and in the convenience of one portable unit. 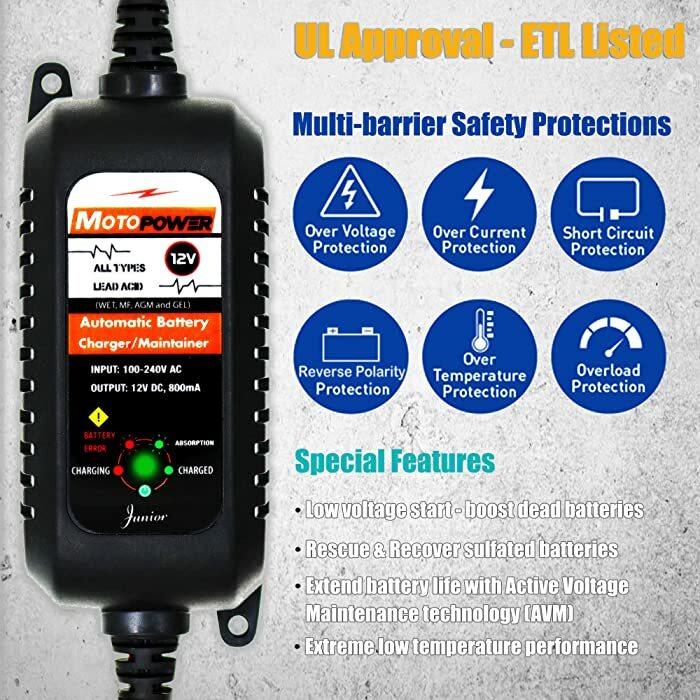 This MotoPower charger is the cheapest option on the list. While it has a relatively low power rating, it’s an excellent value if you’re mostly looking for a maintainer. If your budget’s tight, you’ll love this little charger from MotoPower. It gives you the performance you need for charging and maintaining a boat battery for less than $15. That’s an incredible value whichever way you cut it. Now there is a caveat to this. In terms of power, this has the lowest on the list. It’s rated at 800mA, which is less than an amp. That’s fine for maintaining a battery but it’ll be very slow charging. It also won’t restore batteries that are deeply discharged. With the special functions, it’s safe for use. Most people don’t need a huge amount of power for maintaining a battery, though. 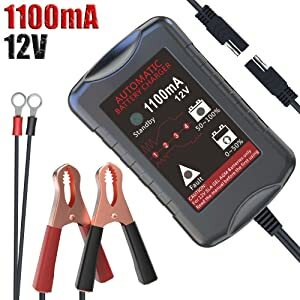 If you’re looking for a cheap option to keep a fresh battery in good shape, this charger will serve you well. This Minn Kota charger is an excellent mid-range option with a rugged no-frills design that resists water and corrosion. While it doesn’t restore dead batteries, it’s perfect for on-board maintenance. If you’re looking for a rugged, no fuss portable battery charger, this Minn Kota on-board charger fits the bill. It works on any style battery up to 12V and is portable enough for on-board use. The all-plastic casing is waterproof, too, so you can use it on the water without a worry. The no-frills design of this charger has its good and bad points. On the plus side, it’s virtually indestructible and super easy to use. The negative is it doesn’t give you much information about the battery’s status. You won’t want this charger if you need to recondition or restore a battery. For regular maintenance and daily use, though, this Minn Kota charger is both durable and efficient. 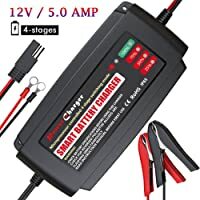 This is the most affordable option for charging 24v batteries. Its rugged, compact construction makes it perfect for both land and water vehicles. Chargers for large batteries can be expensive. 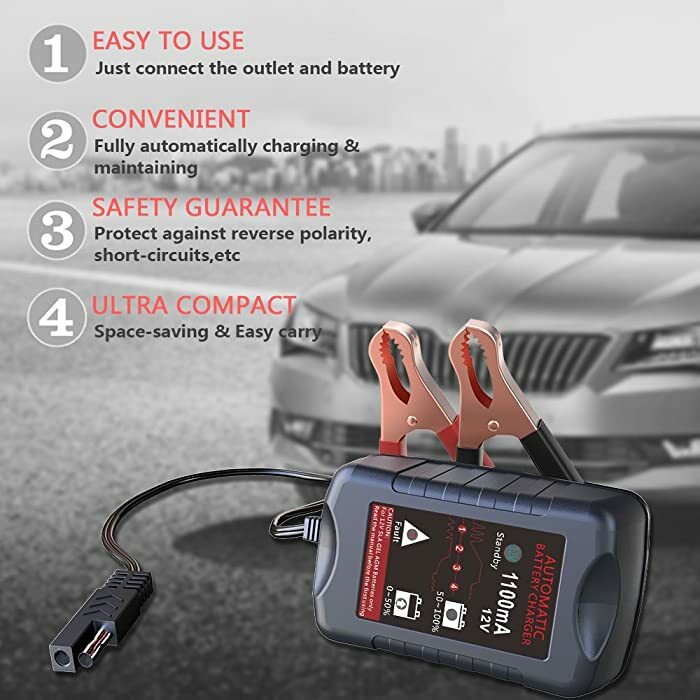 If you need to charge a 24v on a budget, look no further than this Smart Automatic charger. It gives you massive power for less than fifty bucks, and without losing anything on the quality front, either. 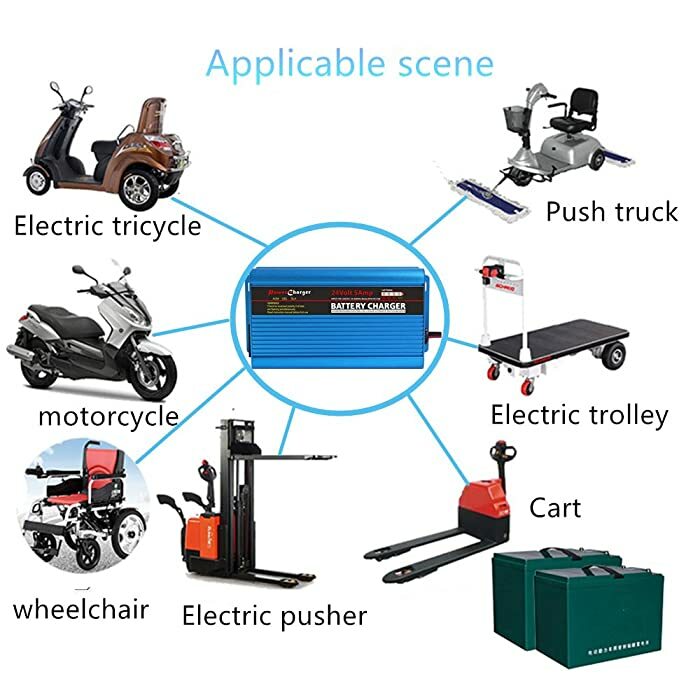 Ideal for boat, motocycle, electric tricycle, push truck and so on. This unit has built-in safety features to protect against over-charges and short circuits. The only thing we’re wary of from a safety perspective is the metal casing. If you have a metal boat, you’ll need to insulate the charger to prevent transferring the charge. That small issue aside, this is a fantastic charge for both water and land vehicles. This versatility makes it an even better value. At just over a pound, it’s also very compact and portable. 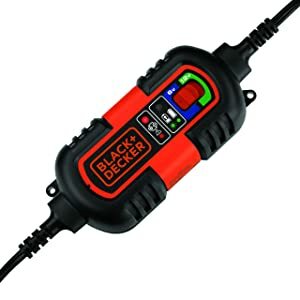 Here’s a portable charger from Black+Decker that’s both versatile and affordable. While the charging speed is a bit low, it otherwise offers safe and reliable performance in an easy to use package. Black+Decker is a name you can trust. In this case, they’ve also brought you a charger that’s an exceptional value. With an option for either 6- or 12-volt batteries, the BM3B is a versatile and affordable way to maintain all your vehicles. 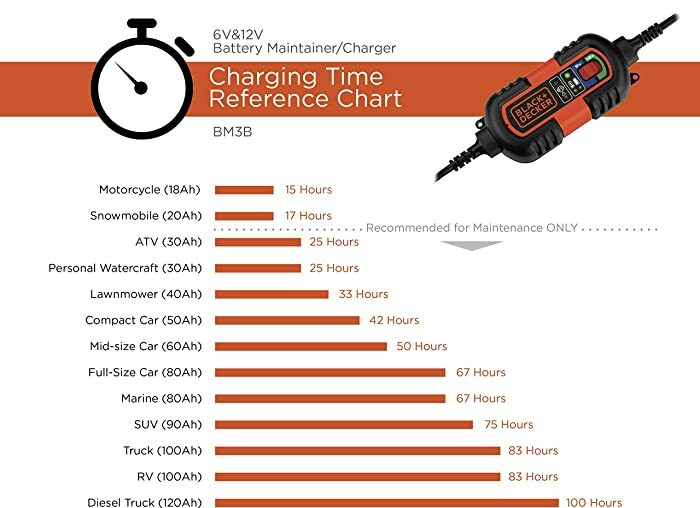 Charging time reference chart of BLACK+DECKER BM3B. This portable, lightweight charger has built-in mounting brackets to make installation easy. It’s simple to switch from clamps to rings or to hook them up to a battery. The multiple layers of safety features make it safe for anyone to use, too. If you want to take all the guesswork out of charging, a smart charger is the answer. 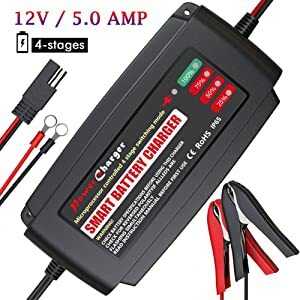 This is one of the cheapest and most dependable smart battery chargers you’ll find. This compact unit from Battery Tender is great for both daily charging and maintenance in storage. It’s safe for any 12-volt battery, with durable water- and weather-resistant plastic casing. 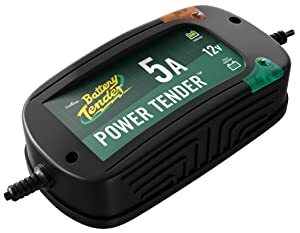 This 5-amp smart battery charger from Battery Tender is a great choice if you want a maintainer you don’t have to think about. The 4-stage smart charging system automatically senses how much current your battery needs. In addition, built-in protections prevent over-charging and power surge damage. The size of this Battery Tender model makes it truly portable. It weighs just under 2 pounds and will fit easily into any boat engine set-up. It’s built to last, too, with redundant protections against short circuits and over-charges. Here’s another option that is both portable and affordable. 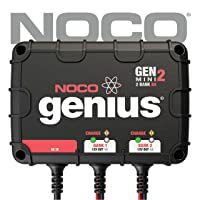 Its completely waterproof design makes it a great all-weather charger, and it’s the best boat charger in the under-$20 price range. Finally, we have another option for the budget-minded consumer. 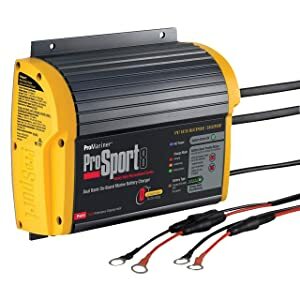 This LST model is the most affordable deep cycle battery charger you’ll find. While it’s not the fastest charger out there, it will maintain your battery anywhere, in any conditions. 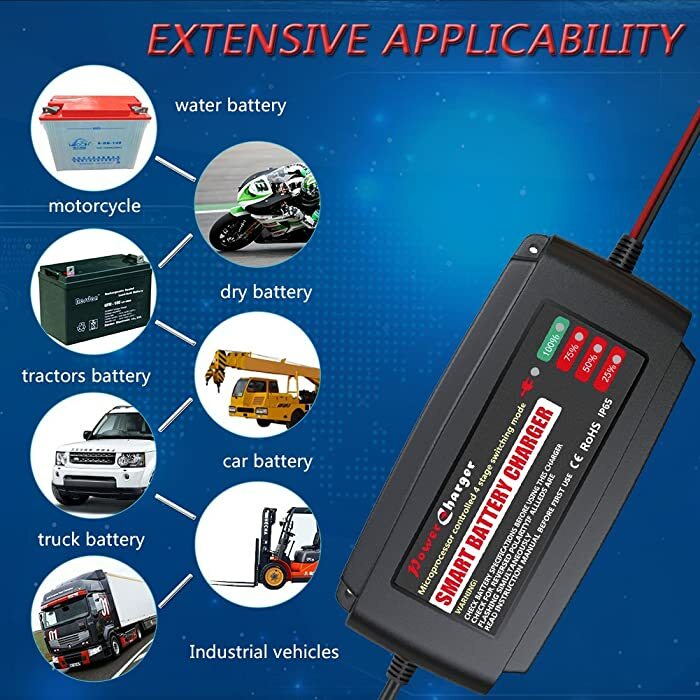 Four special functions of LST 12V Battery Trickle Charger. The design of this charger is impressive. It’s not only very lightweight, it’s also completely waterproof. The all-plastic casing means you can mount it on any boat without concern. If you want fast charging, you may need to look elsewhere. 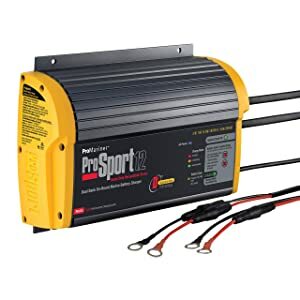 For regular maintenance, though, this is arguably the best boat charger for the money. The right boat charger depends on what kind of battery you have and how you plan to use it. While there’s no one right answer, if we were pressed to pick a favorite, we’d have to go with the ProMariner ProSport 12. With two banks and 12 amps of power, it’ll charge or maintain any battery. Still need some help figuring out which boat battery charger is right for you? There are a few different ways to make your choice, but it all comes down to what your battery needs. The buying guide below will guide you through what questions to ask. The most important features to look for on a boat battery charger are its voltage and output. First and foremost, you need to get a charger sized for your battery, whether that’s a 6v, 12v, or 24v model. Make sure it has a setting for the exact voltage you need or you risk causing damage to both the battery and charger. The output of a charger is measured in amps. This tells you how much power the charger will send to the battery. A higher amp rating not only means a faster charge, it also lets it charge larger or more deeply discharged batteries. Portability: Unless you use your boat regularly and year-round, you’ll need to move your charger from place to place. A smaller, more lightweight charger is easier to transport. Casing material: Anything you’ll be using on a boat will be close to water. A fully-waterproofed casing can help guarantee your charger isn’t damaged. Also remember that metal conducts electricity, and this can be a huge safety risk around water. A plastic charger is the safest choice. Number of banks: A charger with dual banks can charge two batteries at once. If you use a two-battery set-up for your boat, this will let you maintain both with one piece of equipment. Desulphation and recovery: Brand new batteries will only need to be maintained, but older batteries need more love. A charger with reconditioning functions can restore damaged or deeply discharged batteries. This will save you time and money in the long run.